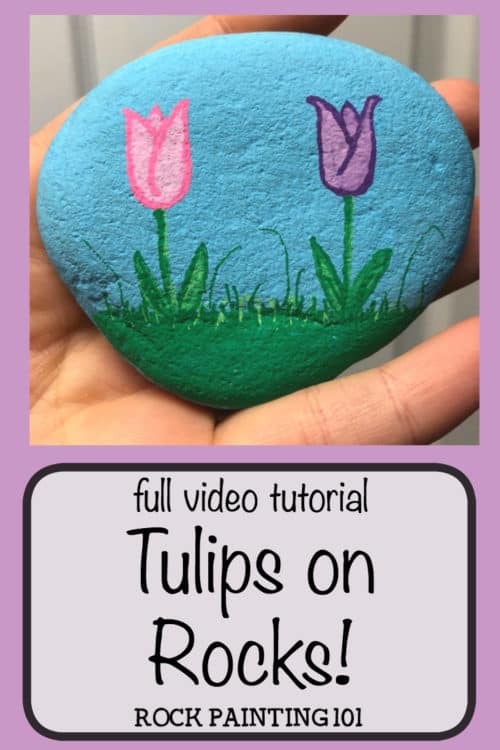 How to make tulip painted rocks. Perfect for spring. These tulip painted rocks are the perfect rock painting idea for spring! Learn how to draw a tulip while creating a rock that’s perfect for hiding, gifting, or decorating! Tulips are one of my favorite spring flowers. I can’t be the only one who loves tulips! Once I see tulips popping up, I know that spring has officially sprung. Because tulips are the theme for week 12 of our #52Rocks! challenge, I wanted to share my quick trick for drawing a tulip. 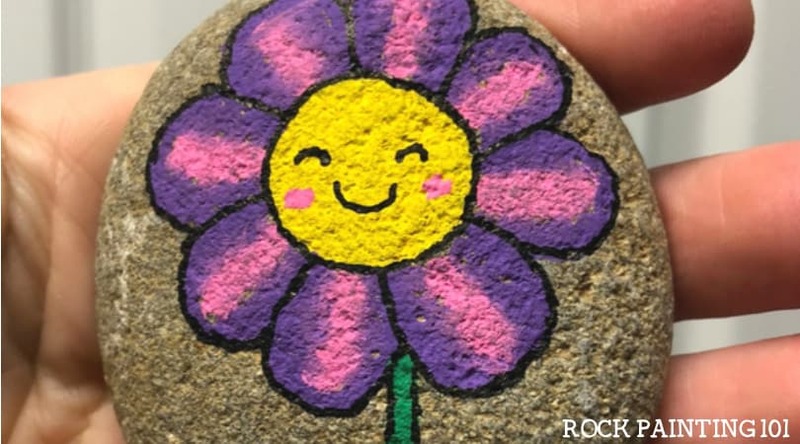 It really makes this flower rock super easy and a perfect rock painting idea for beginners! 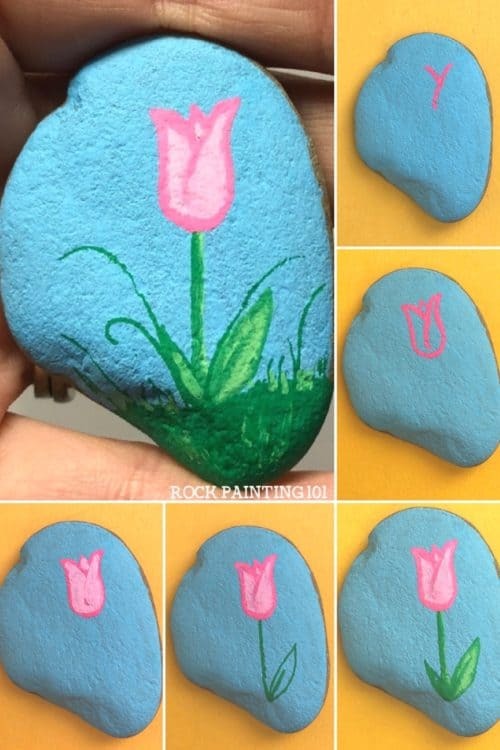 How to draw a tulip onto a rock! These tulip painted rocks really stand out if they are painted onto a base coat. I used a nice blue background. To add a quick base coat to your rocks, check out my tips here. Start by painting a nice green space for your tulips to grow out of. To draw a tulip, draw a lower case “Y” wherever you want your tulip to be. Add a mountain top to the middle. The finish it up by drawing the letter “U” from each point of your “Y”. If you want a little more bloom in your tulip, just give the edges a little curl. Fill in the tulip with a lighter color. If you paint over your lines, that’s ok. Just go back over the lines with your dark color. Tulip stems are very straight, so just draw a nice line going from the base of the bud to the grass. Add a couple of leaves at the bottom of the stem. 101 Tip! : If your rock is lumpy, don’t press down too hard! It will keep your pen from splattering. Finally, some highlights to the stem and grass with a lighter green. 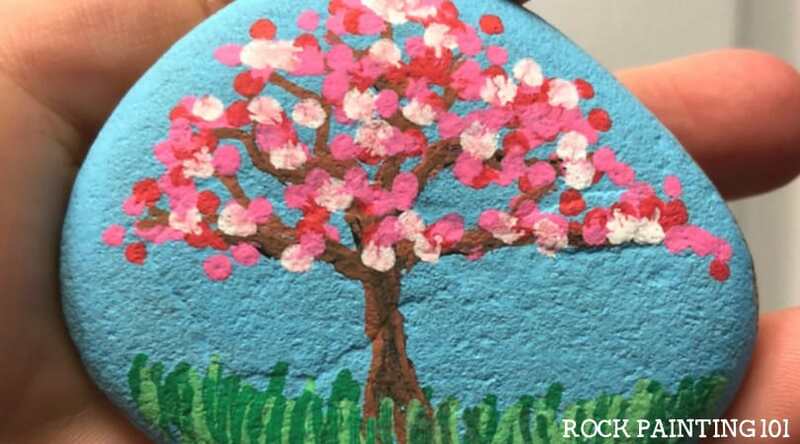 You can stop with one painted tulip, or you can paint a rock that’s lined with them!